Jim Wildsmith is employed as a Negotiator/General Administrator at present. He was educated at senior level at Retford Grammar School where he attained 5 ‘O’ Level Passes. After various jobs through his career he was employed as a Postmaster before retiring in 2015.These jobs included being a Transport Manager and a HGV driver. Jim has been married to Lyn for 48 years and has 2 grown up children (Paul and Joanne)along with 5 grandchildren whose ages range from 19 years to 1 year. 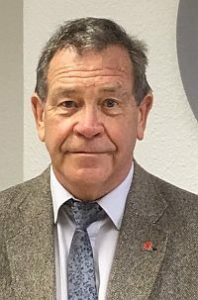 His hobbies include playing golf and supporting Barnsley FC, which he has done from childhood.He also enjoys having time with his grandchildren, holidays and having the occasional pint.